Quitting is your best decision ever! Ear acupuncture uses acupuncture points on the skin of the ears rather than other parts of the body (as for example, in Traditional Chinese Medicine body acupuncture). In most styles of ear acupucnture in Europe & North America , very fine needles are inserted to a very shallow depth, often using an insertion method known as the ‘Flying Needle technique’. This involves the trained practitioner to perform a movement to make the needle spin on its insertion, thus minimising pain to the sensitive areas of the ear. Once in place, the needles simply stay put, usually for 20 to 30 minutes, and the patient is encouraged to relax. With a good practitioner, the needling sensation can be described as painless at best and like a small pinch at worst. 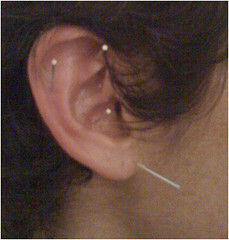 Some ear acupuncture schools emphasize the angle at which the needles stand to the skin, to ensure the best treatments. Many practitioners have the person receiving ear acupuncture sitting on a chair, not lying on a couch. One idea is this may help the person become used to a feeling of being relaxed, but not necessarily with sleepy, less than aware sensations that many of us in the West associate with relaxation. For example, if you ask many people of their idea of a relaxing time of it, you may get an answer such as unwinding with a glass of wine or having a beer after a long day. The alcohol depresses the central nervous system and produces a little disinhibtion, creating what the person describes as the ‘relaxation’. The acupuncture produces a different effect, in that people can safely experience being fully alert, yet feeling very calm and comfortable. For smokers, this calm centering may be a helpful antidote to the anxious feelings that a cigarette craving can produce for them. Ear acupuncturists may also offer ear seeds or ear magnets. These are Traditional Chinese Medicine herbal seeds (wang xing bu ling) or special tiny magnetised metal balls, which come on a prepared piece of skin compatible adhesive tape. These are then taped onto the ear like a minute version of a band aid. The seeds are gently massaged by the patient a number of times a day, whereas the magnets require no massage. This helps to prolong the rebalancing effect, or can be useful by itself. Needles used are generally disposable and good practitioners follow strict Health and Safety codes formluated by their professional bodies which will adhere to local laws. Good practitioners also won’t mind you asking them questions about health and saftey issues at all. According to Traditional Chinese medicine, the body’s vital energy, the Qi flows through twelve regular channels, translated from the Chinese commonly as Kidney, Heart, Lung, Large Intestine, Liver, Pericardium, Spleen, Small Intestine, and eight extraordinary channels which connect to each other and the twelve rgeular channels. The aim of regular ongoing ear acupuncture sessions is to help rebalance the flow in the channels and therefore restore the body towards health. As an additional factor, TCM views body and mind as an integrated whole, rebalancing the body’s Qi therefore has an effect in calming the mind – which should be welcome for dealing with some anxious, unpleasant emotions some people have temporarily whilst stopping. DISCLAIMER: NO information here is intended to be taken as medical advice – or used as a substitute for professional medical advice. Any person with any health concerns is advised instead to consult their doctor. In the case of persons seeking therapy using Traditional Chinese Medicine, this information cannot be taken as medical advice and persons are advised instead to consult a suitably qualified professional practitioner. Which Acupuncture Points Are Used With Depression?